Veronica Mars didn't last long on the air -- just three seasons. But looking to strike at the property before it potentially exploded, Inkworks took a roll of the dice with the show. 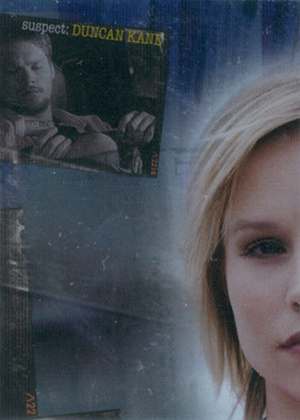 Several years later 2006 Inkworks Veronica Mars Season 1 trading cards should certainly appeal to fans but a wider audience as well thanks to some very solid autograph and memorabilia cards. The base set has 72 cards. Recapping both the main story threads, it's an informative set but not very attractive. Many of the images are blurry and poorly colored. It's good for a quick refresher in case you ever need one, but the graphics look so much better on the show. 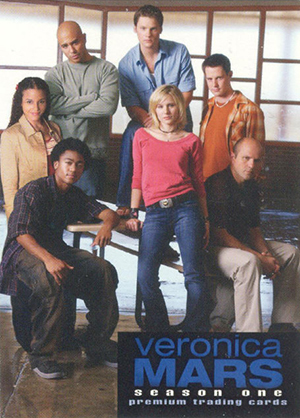 The main draw of 2006 Inkworks Veronica Mars Season 1 is the autographs. Landing one per box, the set as 11 cards. Topping the checklist is the show's star, Kristen Bell, who has gone on to have a very solid career since the show's end. Be warned, though. Her autograph was a redemption. Not only is the set old, but Inkworks went out of business a couple years after the set came out. In a nutshell, you'll have a better chance of having one fall out of the sky than to get an actual Bell signature in a box. This isn't a one-note set though. At the time, Amanda Seyfried was a relative unknown. Now she's on the cusp of becoming an A-list Hollywood star. Other faces many collectors might recognize even if Veronica Mars is completely foreign include Anthony Anderson, Max Greenfield (The New Girl) and Tina Majorino (Napoleon Dynamite). 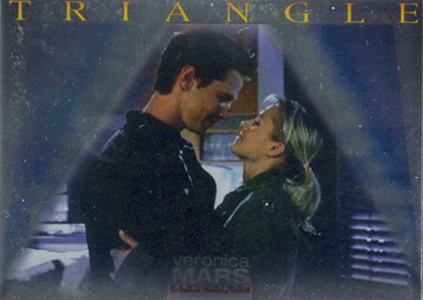 Every box of 2006 Inkworks Veronica Mars Season 1 also comes with a Pieceworks costume card. Many of the wardrobe pieces used to make them are very colorful. This also leads to lots of patterns and variations. While the lead stars are among the most popular, one of the most notable comes from a guest star -- Paris Hilton. The remainder of the set follows the Inkworks formula. There's a nine-card foil puzzle, which goes by the name Who Killed Lilly Kane, and a six card foil set, Revolving Around Mars. Every box also comes with one of three Triangle box toppers. 11 cards. Inserted 1:24 packs. 6 cards. Inserted 1:17 packs. Uncut sheet sold separately (#/199). 3 cards. Inserted one per box.